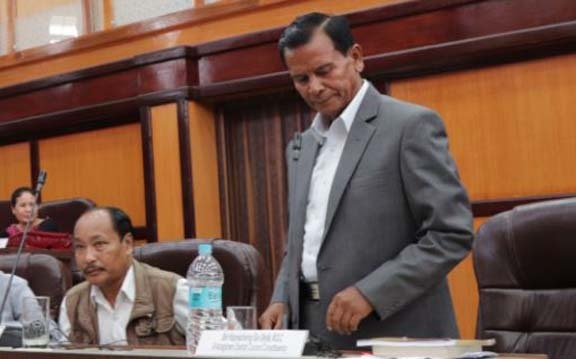 The Chief Executive Member (CEM) of the Khasi Hills Autonomous District Council (KHADC) on Thursday accused the Central Government of attempting to indirectly introduce the Panchayati Raj system in the State through its scheme called, “My village my development plan”. KHADC Chief Executive Member HS Shylla brought this allegation after different Dorbar Shnongs sought a clarification on the recent directive to the Community and Rural Development (C&RD) blocks to form Gram Sabha committees for availing the scheme. The scheme ‘My village my development plan’ is being implemented directly by the Ministry of Panchayati Raj. “This is nothing but an attempt to indirectly introduce the Panchayati Raj system in our tribal villages,” Shylla alleged. He said that though the Council has not received any official communication from the State Government in this regard, but he came to know about it from the traditional heads in his Nongkrem constituency. Shylla said that the Council strongly opposes the Centre’s move as it appears that the Centre wanted to win the people by pumping funds through such a scheme. KHADC Executive Member in-charge of Land, Mines & Minerals, Latiplang Kharkongor said that the scheme was introduced despite the fact that Meghalaya has been exempted from the Panchayati Raj system. “Such move only seeks to dilute the traditional institutions under the Sixth Schedule to the Constitution of India. What is more worrying is that, the status of the Sarpan (head) of the Gram Sabha is equal to that of a Rangbah Shnong. Elections of the Gram Sabha will be also held and this will later open up opportunity for people from other tribes to demand for their rights to be part of the committee,” he said. He, however, warned if such schemes are allowed to be implemented in the state the powers of the traditional institutions will no doubt be diluted.